Nearly two years have passed since the disappearance of MH370, the Malaysia Airlines flight that vanished on its way from Kuala Lumpur to Beijing with 239 people on board. A U.S. firm, Phoenix International, will rejoin the search next week aboard a Chinese vessel, which will join three Dutch ships in scouring the Indian Ocean. The underwater search will take place in the southern Indian Ocean, off the west coast of Australia. Phoenix International's side scan sonar, which can create an image of large areas of the sea floor, will be towed from the Chinese Rescue Ship Dong Hai Jiu 101. Experts say the Phoenix Synthetic Aperture Sonar is more accurate than the traditional 75 kHz side sonars that were previously used. According to Phoenix officials, the SAS provides a "higher degree of resolution," especially at the outer ranges of sonar. It also allows 24-hour access to instant data with less need for battery replacement. "We fully understand and appreciate the magnitude of this effort, and we look forward to assisting the ATSB [Australian Transport Safety Bureau] in finding MH370 and bringing closure to those impacted by this tragic event," said Mike Kutzleb, President of Phoenix. Phoenix has assisted in the search before; it was first contracted three months after the plane disappeared. MH370 is thought to have gone down in some of the most remote ocean stretches in the world. Numerous underwater searches have failed to locate debris on areas of the ocean floor that are yet unmapped and up to 6,000 meters deep. The area is fraught with unforeseen danger. An Australian search report mentions "underwater mountains, crevasses, ridges and 2,000-meter sheer cliffs." Last month, an underwater sonar device, called a towfish, slammed into a 2,200-meter high mud volcano. The cable snapped and the towfish — along with 4,500 meters of cable — plummeted to the ocean floor. Experts say it is possible to recover the equipment at a later date. Over the course of the search, two previously unknown shipwrecks have been found. In January 2016, sonar photos revealed a strange object. The Shipwreck Galleries of the Western Australian Museum determined the object was a ship made of steel or iron from the turn of the 19th century. 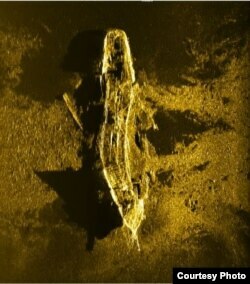 Last May, debris was located from the wreck of another ship. The largest object — in the shape of a box — was about six meters. Without any substantial debris to study, the Australian Defense Science and Technology Group (DST) says the most likely cause of the plane crash was a right engine flame-out, followed by a left engine flame-out. The analysis took into account the amount of fuel loaded in Kuala Lumpur and the amount used in each engine before the plane's final transmission. Flame-outs occur when a jet fuel in a tank is depleted. The report continues, "It is estimated that the left engine could have continued to run for up to 15 minutes after the right engine flamed out." The only confirmed wreckage of Flight 370 to be recovered was a flaperon that washed up on Reunion Island in July of last year. Last month, a large portion of plane wreckage was found off the coast of Thailand, igniting speculation that it could be from MH370. But Malaysian investigators said the debris was not from the same type of Boeing 777 as the mysteriously missing aircraft. The complete search area is 120,000 square kilometers off the west coast of Australia. “Recent commitments by the People's Republic of China to provide funding and equipment, coupled with Malaysia's ongoing financial contributions, will ensure the thorough completion of the remaining 45,000 square kilometers of the search area," according to a statement from Australian officials leading the search effort. Investigators say they will end all search efforts in June 2016.